I should have said that I bust the bike, just outside camp. Ran over a broken glass bottle at speed, burst front tyre, ran up a bank & turned over. Damage to self nil; to bike somewhat. There goes my power of breaking bounds! * An average of 44.5 m.p.h. for the round trip of 250 miles. .... When my mood gets too hot and I find myself wandering beyond control I pull out my motor-bike and hurl it top-speed through these unfit roads for hour after hour. My nerves are jaded and gone near dead, so that nothing less than hours of voluntary danger will prick them into life: and the 'life' they reach then is a melancholy joy at risking something worth exactly 2/9 a day. ...... That's as irrational as what happened on our coming here, when I swerved Snowy Wallis and myself at 60 m.p.h. on to the grass by the roadside, trying vainly to save a bird which dashed out its life against my side-car. And yet had the world been mine I'd have left out animal life upon it. Crashed off the Brough last monday: knee: ankle: elbow: being repaired. Tunic and breeches being replaced. Front mudguard, name-plate, handlebars, footrest, renewed. Skid on ice at 55 m.p.h. Dark: wet: most miserable. Hobble like a cripple now. and was riding back to Clouds Hill when he came on two errand boys, riding pedal cycles in a dip in the road. He swerved violently to avoid them, lost control, was thrown over his handlebars and received severe injuries to the brain. His physical vitality was so great that he lay unconscious for nearly five days before he died of congestion of the lungs and heart failure. The evidence at the inquest revealed a curious contradiction. Corporal Catchpole of the R.A.O.C. 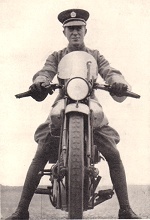 who was standing about 100 yards from the road, near Clouds Hill, saw Lawrence on his motor-cycle, travelling at about fifty or sixty miles an hour, pass a black private car, going in the opposite direction, just before he heard the crash. The two boys, whose evidence about times was confused, had no memory of a car passing them. Mr. Cairns, the brain surgeon, stated that had Lawrence lived he would have lost his memory, been paralysed and unable to speak. Lawrence was buried at Moreton Church on May 21st. 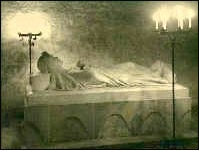 His bust by Eric Kennington has been placed in the Crypt of St. Paul's Cathedral, a recumbent figure in Arab dress by Kennington has been placed in the ancient Saxon St Martin's church at Wareham, and his cottage at Clouds Hill now belongs to the National Trust and is shown to visitors. I am not a very tractable person or much of a hero-worshipper, but I would have followed Lawrence over the edge of the world. I loved him for himself, and also because there seemed to be reborn in him all the lost friends of my youth. If genius be, in Emerson's phrase, a "stellar and undiminishable something", whose origin is a mystery and whose essence cannot be defined, then he was the only man of genius I have ever known.
" - the popular verdict that he is the most remarkable living Englishman, though I dislike such verdicts, I am inclined to accept - "
Most of the letter excerpts and quotes above are from The Letters of T. E. Lawrence of Arabia Jonathan Cape 1938, and Selected Letters of T. E. Lawrence Jonathan Cape 1938, both edited by David Garnett. Photographer of the Kennington effigy unknown. Photograph top of page from Lawrence and the Arabs Jonathan Cape 1928 by Robert Graves.